Bladder incontinence may be caused by conditions such as age-related changes in the lower urinary tract, urinary tract infection, and conditions not directly related to the genitourinary system, such as diabetes, cancer, stroke, cognitive impairment, and mobility impairment. Individuals who are incontinent may carry an emotional burden of shame and embarrassment in addition to the physical discomfort and disruption of their lives that occur with episodes of incontinence. In a study from the U.S. Department of Health and Human Services more than a quarter of noninstitutionalised American men aged 65 and older reported a urinary leakage(1). The number of European incontinent men are likely similar to the Americans. Treatment and promotion of continence should be the primary aim, but for those men where this aim is not possible, a male external catheter (MEC) may be a good choice. In the U.S. the use of MEC has decreased steadily from a peak of 34.6% in 1972-1975 to a low of 1.5% in 2001-2005(2). This is in contrast to the number of men experiencing urinary incontinence and may be due to the fact that many nurses are unfamiliar with the various types of MEC and also its use. 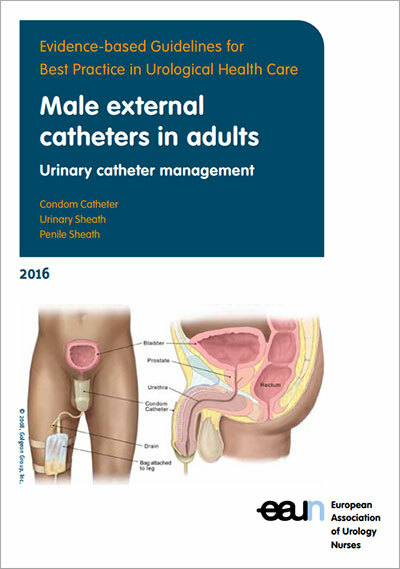 Therefore, the EAUN working group is pleased to present an evidence-based updated version of the 2008 guideline on Male external catheters in Munich at the 17th International EAUN Meeting. The working process for this guideline was similar to the evidence-based guidelines issued in previous years, with a systematic literature search done in the summer of 2015. Two guideline group meetings and three video conferences were held. A blinded review was conducted with the participation of specialised nurses, urologists in various countries and a patient organisation representative. The written guidelines are made up of three parts. The first part is methodological and stated the building process used for writing the guidelines and the definitions of terms. The second and principal part is composed of chapters on the indications and contraindications with regards the use of male external catheters. These are followed by chapters describing the products and material, the principles of management and nursing interventions, complications, nurse and patient education. The third part is made up of documents describing the procedures, which help the nurse how to use the MEC in a step-by-step manner. In writing this guideline we had the same challenge as with the other nursing guidelines in finding high-level evidence regarding the choice of MEC, frequency of changing the MEC and how to obtain a valid urine sample for culture from the MEC. Low-level evidence indicates that no higher level evidence was found in the literature, but this cannot be regarded as an indication of the importance of the recommendation for daily practice. This guideline has clear recommendations for patient assessment, choice of MEC and educational issues. The guideline also highlights the need for more research in this nursing field. The guideline can be downloaded for free while the printed version can be ordered by sending an email at info@uroweb.org. National societies that would consider translating these guidelines can find the rules for translation on the EAUN guidelines webpage or send a request directly to the EAUN at eaun@uroweb.org. We would like to thank Coloplast, Hollister Incorporated and Manfred Sauer GmbH for supporting this independent guideline with an educational grant.